I interned at Fidelity Investments in Jersey City, NJ in summer 2015, as a UX design intern. As a departmental project, I worked on a conceptual design for a retirement income planning tool, giving customers the views of income breakdown, income projection and expenses analysis, as well as interactive features within their portfolio. In this project process, I accomplished competitive product analysis and had brainstorming session with business partners in Smithfield, and did design iteration in following design meetings. I apologize that project details are not disclosed here because it is not published yet. As for internship project, I worked with other interns from North Carolina and Boston to build an offical website for Fidelity UXD group. We conducted user research with Fidelity employees about what they think of UXD is and what they expect to see on the website. I attended design thinking workshop at Boston office for better understanding their UXD process and ideation. With all the development work established, we held user testing sessions with internal employees and presented the final project at Boston office to the whole Fidelity UXD group. This website went online in January 2016! This is a homepage prototype we proposed to Fidelity. The hard time for us was to work on the content for the prototype and iterate the wording. This is the initial design of the work page, to showcase the projects being done in this in-house team and the office environment. After the internship program, the development team at Fidelity integrated the layout into one-page scroll, with some prototype style from our intern project. 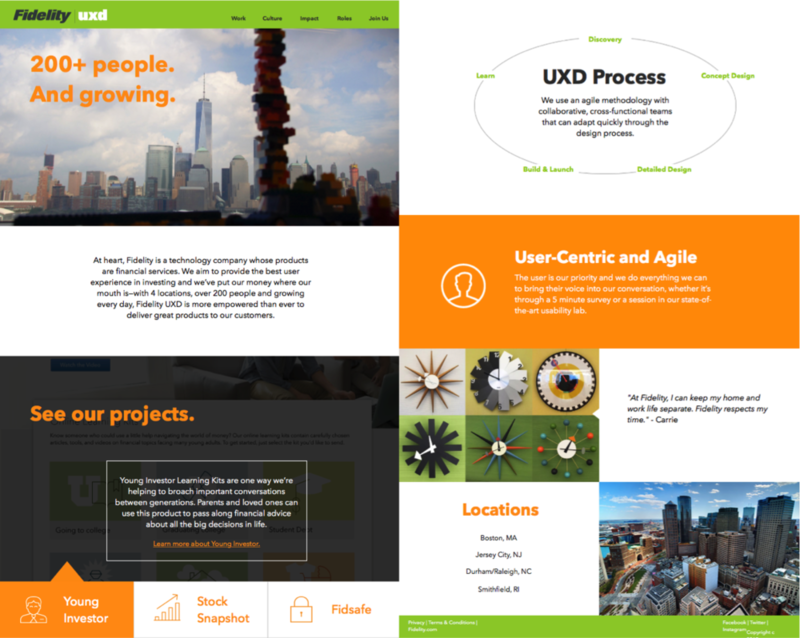 Please visit the final output here: Fidelity UX Design.